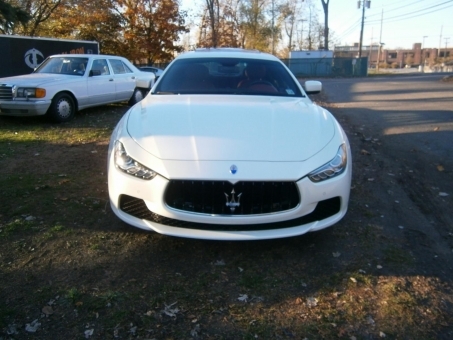 2014 Maserati Ghibli Q4 is absolutely stunning with a Bianco Alpi Pearlescent Exterior complimented well with a Rosso Trofeo Premium Leather Interior. Car is basically brand new, only 7,366 miles, one owner, no accidents. This car is simply top of the line and has every feature you could possibly imagine such as an 8 speed automatic transmission, all wheel drive, keyless entry with push button start, bi-xenon lights, bluetooth, rearview camera, auto dimming mirrors, navigation, 8 speakers, power seats, 20" alloy wheels, and red calipers to name a few. Car has executive/luxury package, sport package, and premium package.